It never occurred to me to feel any tragic deprivation. But now I understand that until 2012, we M&R geeks were shockingly under-resourced in one crucial pop culture genre: reality TV. I only discovered this a few weeks ago. I was searching on YouTube for videos of jousting I could show to my British literature students, hoping maybe for a clip from a Renaissance Faire or something. Instead I came upon … well, it was just too good to believe. A trailer for the The History Channel show Full Metal Jousting. Yes, they really joust! None of this Renaissance Faire theatrical choreography crap: pfuh! This is the real deal. Sixteen beefy guys with a glint in the eye and a fire in the belly suit up in 80 pounds of bristling steel armor, climb onto 1800-pound horses (they need a “ground crew” and a set of steps to get this far), and gallop at each other with 11-foot wooden lances at 30 miles per hour. So that means about 2000 pounds focused in a 1.5-inch diameter lance tip … let’s see, multiply mass by acceleration… carry the one… yeah. That’s gonna hurt. Whose lunatic idea was this? Well, here’s where we delve into some of the stranger subcultures of North America. 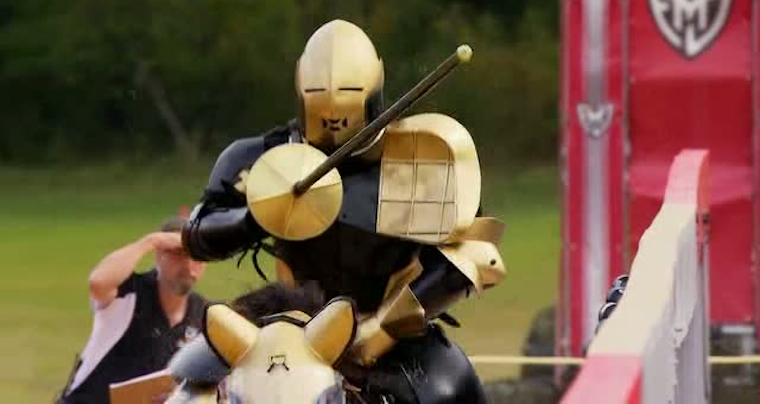 The show’s creator is Shane Adams, an intelligent and civilized person who was a professional theatrical jouster and then shifted to competitive jousting—yes, it’s a thing—and won the world championship. He and some other competitive jousters wanted to “take full-contact jousting to the next level” and make it a professional arena sport like Mixed Martial Arts or bull riding. Adams thought this show could do for jousting what The Ultimate Fighter did for MMA (evidently MMA is definitely a thing). Adams’ idea was to take sixteen guys who were not professional competitive jousters and train them how to do it, then have them compete for a cash prize and the baddest bragging rights in modern times. The number one requirement for contestants was excellent horse riding skills. Actually, that was number two. Number one was being crazy. But riding skills was next. And then a fondness for pain. And then competitive spirit. Adams would teach them the rest, with the help of two trainers (one of whom is named “Ripper”). Jousting in historical fashion, it turns out, is extremely difficult and more technical than you might guess. The goal is to lower the lance at just the right moment to hit a metal target on the other guy’s shoulder about the size of a license plate. A hit is worth 1 point. If you break your lance into splinters: 5 points. If you unhorse the other guy: 10 points. Managing the lance is awkward, the target is small, you’re galloping on a bouncy horse, you’re wearing 80 pounds of armor, you can barely see, and the hits feel like a car crash. So who on earth would do this? Back to those strange subcultures. Among the contestants were five theatrical jousters, an Olympic caliber show jumper, an ex-marine, a riding trainer, and the world champion steer wrestler—a sweet-spirited man named “Rope” who used his home ranch’s website to blog his experience and “give a running commentary … of what the Father showed me while I was on the show.” Yes, he means God. With all that going for it, you are perhaps wondering why you have not also heard of this show. Well, I am sorry to report that it was cancelled after one season. I know. Isn’t it terrible? They did what they could. The History Channel got the show’s premier, in February of 2012, covered in the New York Times and the Huffington Post, which referred to jousting as “the preferred extreme sport of badasses of yore.” And the show did garner some fans. One writer for The Guardian named it his “TV programme of the year” for its “glorious stupidity” and “brilliant, unreconstructed, gormless fun.” Word about the show reached down to the deeper layers of the geekosphere, to the horsey sites and armory sites and medieval geek sites. An LGBT pop culture site had a story on the one gay competitor. Even so—and despite a Facebook fan site whose sole purpose seems to have been petitioning the History Channel to renew—it was all over in one season. By my estimation, three main things went wrong. One: how are you going to find yet another passel of sixteen insane and equestrianishly qualified people to risk tooth loss and permanent skeletal damage? The prize was only $100,000. As Adams says, violent contact sports are part of “North American culture” and some people enjoy getting hit, there’s no explaining why. But a mere hundred grand is not worth it. Two: jousting matches consist of eight passes lasting only a minute or two each. So most of each episode has to be filled with footage of training regimens, which, admittedly, start to get a little repetitive. Third, and I mean this seriously: they underplayed the horses. Watching people do something dangerous and technically skillful is all the more fascinating when this endeavor requires the cooperative partnership of a large animal. We did not spend enough time on the show getting to know the horses. As I explored websites looking for background on the show, the most interesting thing I discovered was a horsey site in which Shane Adams went on with great energy and affection about the horses on the show, all of which he trained himself. And so, alas, like everything else adored by M&R geeks, this show exists in the past. You can, if you wish, purchase DVDs of Full Metal Jousting. You can, if you wish, look up the matches and scores on Wikipedia. Unfortunately—and this may be another problem for its future as an extreme sport—jousting stats are not all that captivating. Despite the disappointments we all face in the ever-churning, fickle world of reality TV, we can acknowledge at least one good outcome. We at last have the answer to a very important question about football, that other violent sport now harassed and criticized by those who lament our American thirst for gladiatorial blood. The question is this: Do we only love football for the violence? Well, we might think of Full Metal Jousting as an experiment in which football is effectively reduced to just the hits—with horses! And this did not, in the end, appeal. So perhaps we do not love football only for its brutality. In fact, compared to jousting, football seems more like ballet. One other possible outcome. I met a woman last week who runs an equestrian therapy program. I told her about the show, and we wondered together whether jousting might also be used as a form of therapy, perhaps for the testosterone-excess challenged? Perhaps it could even be a ministry? You know, Mark Driscoll may need a fresh start soon. Maybe he should look into it.